David Denham’s port of the late Tim Hartnell’s Adventure Shell is now available to download from the Adventure Games section of my website. Written in BASIC, this is a simple package to help create new adventure games, simply by altering names and descriptions in an easy to edit and well documented BASIC program. 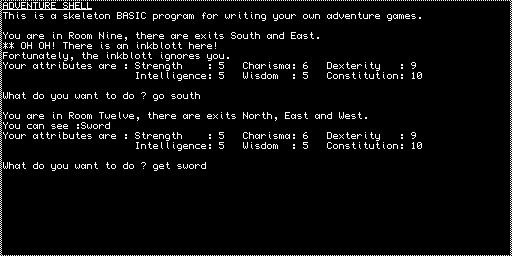 Adventure itself consist of one BASIC program and a Quill _doc file, that’s all. Free to use and without restriction other than naming the author, this package provides a simple way to author new adventure games without having to learn any new game creation software. As supplied, it’s already a very simple playable no-frills game. The finished game is a SuperBASIC program – compile it with Turbo or Q-Liberator if you wish. Hopefully, users of this package will send in example games created to make available on the page. This entry was posted in News and tagged Adventure Shell on 02/05/2017 by Dilwyn.